Crunchy green beans taste wonderful in a rich, nutty coating of walnuts and lots of garlic and ginger. Serve with your favorite Asian noodle or rice dishes. This also makes a great warm or room-temperature appetizer. 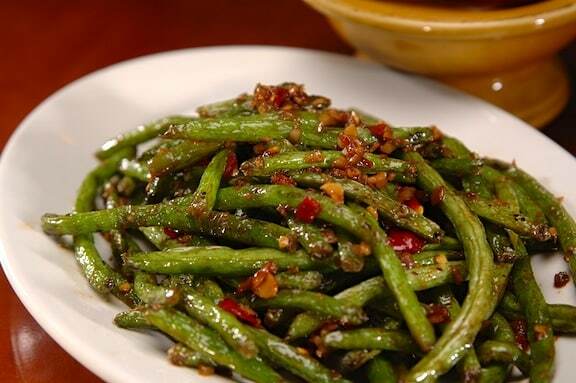 Crunchy green beans taste wonderful in a rich, nutty coating of walnuts and lots of garlic and ginger. Heat the oil plus 2 tablespoons of water in an extra-large skillet or stir-fry pan. Stir in the green beans and stir-fry over medium-high heat until bright green. Add the red bell pepper, garlic, ginger, soy sauce, and walnuts. 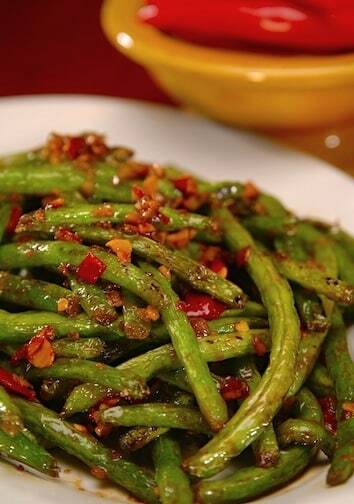 Continue to stir-fry until the green beans are tender-crisp and touched with dark brown spots. Add the hot seasoning to taste, taking into account your guest’s preferences. You can always pass more around for those who’d like more spice. Remove from the heat and transfer to a serving platter. Serve warm or at room temperature with cocktail toothpicks. Note: To make this extra-spicy, use chili oil in place of sesame oil. I love love LOVE this recipe!! So delicious. I’ve made it 3 times in the past month, haha.